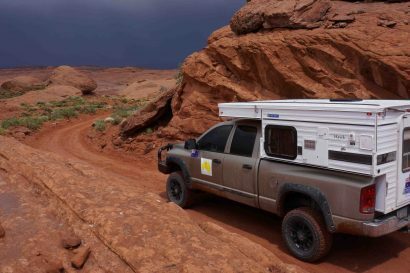 It’s one of the most popular trails in the entire southwestern U.S. and a must-do for any overlander. It’s also relatively short, easily driven in a single day, and flanked by dozens of other equally stunning natural attractions. 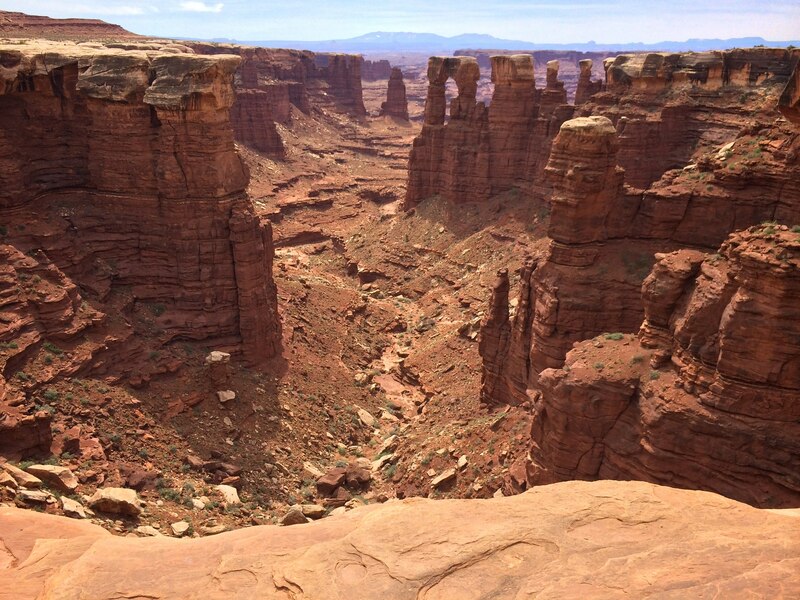 It is of course, the famed White Rim trail near Moab, Utah. 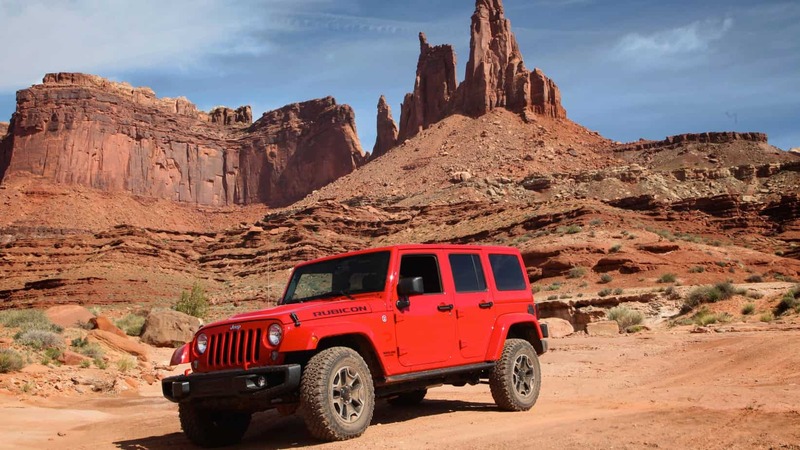 Nestled within the Islands in the Sky district of Canyonlands National Park, the White Rim trail is an 80 mile maintained road skirting some of the region’s most striking landscapes with deep canyons and towering formations lining the entire route. Although not a difficult road, easily driven with a mild, unmodified SUV, it does make for a very long one-day push. Most to visit this area will opt to make it a two, if not three day journey as to allot time to visit the many side roads and hiking trails along the route. The most common direction of travel starts at the eastern end of the road and finishes at the western-most end. The start of the road makes for an impressive introduction as drivers descend deep into the Shafer Switchbacks dropping several hundred feet in just a few miles. 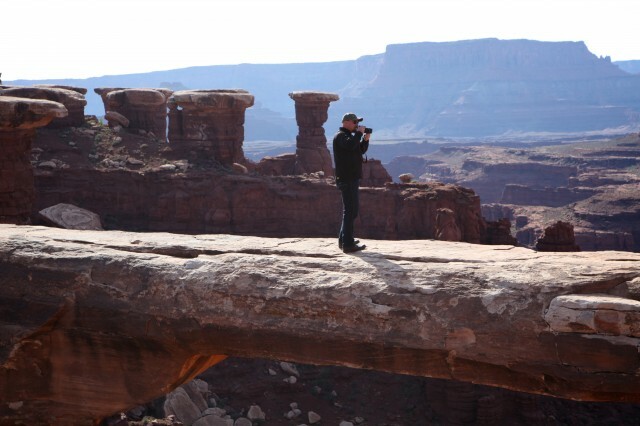 This initial part of the trail offers beautiful views at Gooseneck Overlook and Musselman Arch. 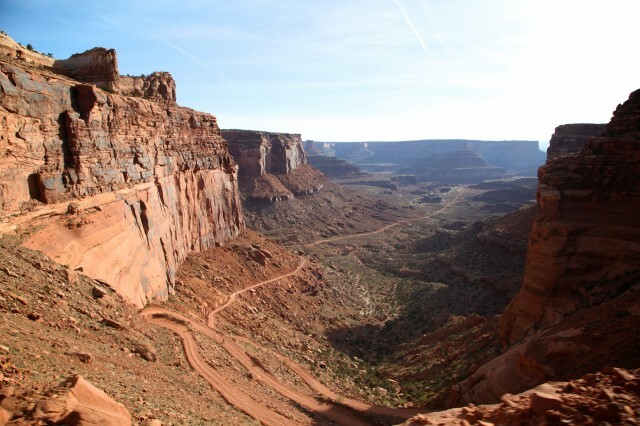 Continuing on, the trail twists and turns while hugging the edge of the White Rim itself as it intersects with Latrhop Canyon, the impossibly steep Murphy Hogback, and the turnoff to Potato Bottom along the Green River. 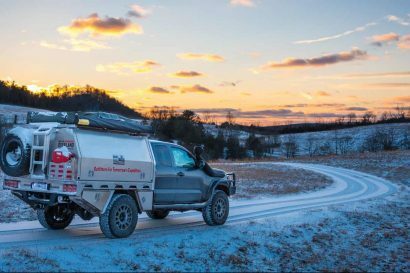 One last steep climb at Hardscrabble Hill puts drivers within easy reach of the trail’s end. 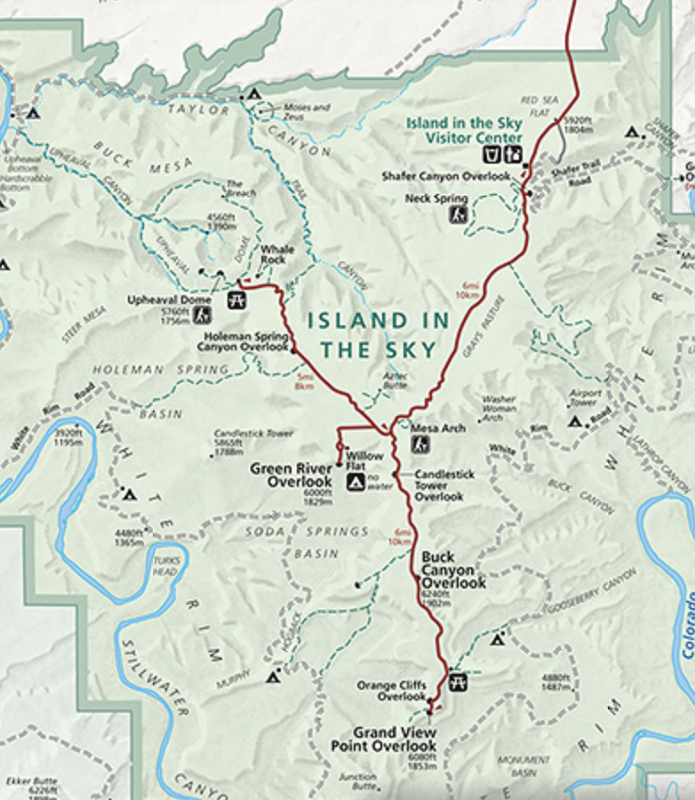 For those wishing to get the most of the area, a number of adjacent trails offer ample opportunity to explore. There are eight maintained campsites along the route, but none offer any water, so make that a high priority in your planning. It’s also important to make reservations for campsites well in advance as they fill up quickly in high season. 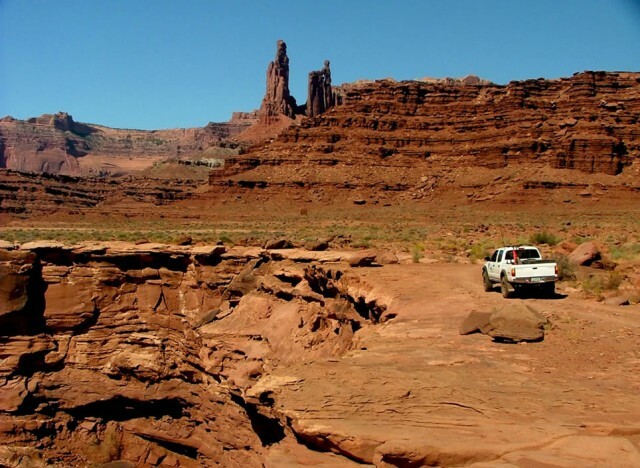 Speaking of season, while the trail can remain clear and open for much of the winter if conditions permit, summer temperatures along the White Rim can be extreme. This makes the shoulder seasons of spring and fall, the optimal time to make the drive. Spring and fall offer the most ideal temperatures with conditions typically stable. Summer storms can create flash floods making the loop impossible. Spring can often be windy with unexpected low temps, as well as slightly crowded. Summer can be brutally hot with little escape from the searing sun. Winter is often mild, but wet conditions can make some parts of the trail impassable. Fall is often mild with high clouds adding to the drama of the scene. 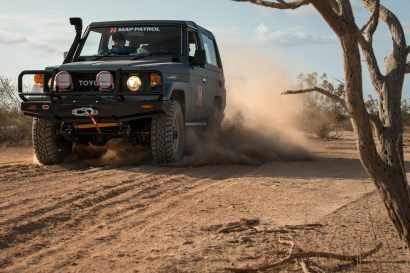 Camping permits are $30 for a 4WD vehicle and must be obtained in advance. Permits can be obtained through an online reservation system. To learn more about permits, visit the National Park Service website. 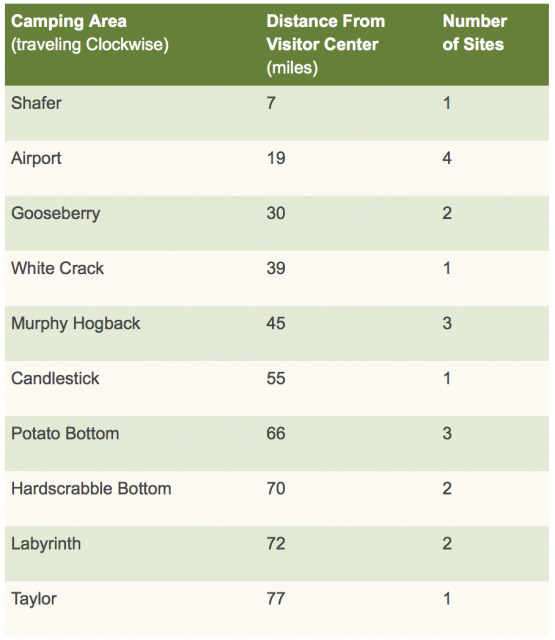 The eight campsites along the route are spaced evenly across the entire route. Some sites offer more seclusion that others, and many are reserved for groups, which are frequent on the trail. From Highway 191, turn west on Highway 313. The trailhead is on the left just before you reach the Canyonlands National Park Visitor Center for Island in the Sky.